Yes, Bradley is in Germany for surgery. He’s getting a “bionic neck” he likes to call it. If you know Bradley, you know the pain he’s been suffering through for some years. Bradley’s problem is associated with an exploratory laminectomy he had in 1987 to search for the cause of symptoms similar to MS and to confirm or deny the potential appearance of a tumor at C1, top of his spine. There was nothing confirmed at that time which would account for this pain and other symptoms that he had. 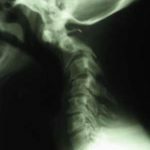 Over time, those symptoms decreased but in recent years, it became unbearable at times, leading him to facet joint injections and consideration of nerve ablation and other alternatives. Acupuncture, physical therapy, nothing helped. 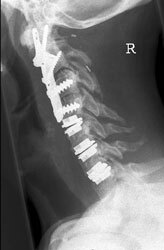 After consulting with some of the best spinal surgeons in Southern California, it was agreed that his neck was unstable and the gap between C1 & C2 of 7 mm was a huge problem. His pain was probably from deterioration of the bone over time at C4 – 6. They all suggested a fusion between C1 – C7; and depending on who we talked to, some wanted to fuse his occiput (skull) to C1 and place a rod/fusion all the way down to T3. 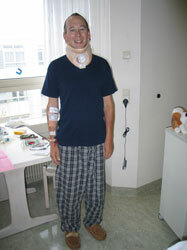 Every option available to him in the U.S. would leave him with zero mobility in his neck and upper back. 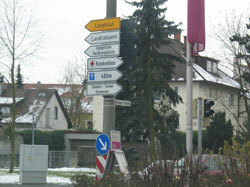 in Germany for several years on thousands of patients. 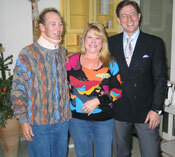 Our friend Christy had a three level cervical disk replacement last spring. She was the person who first told us about all of this and we’ve been watching and learning more since then. Cervical disk replacement is still in the clinical trial stages here in the States but they typically only do one level at a time. Bradley’s problem consumes 6 or seven levels. He considered asking a physician here in Los Angeles to apply to the FDA for compassionate use, but with his complex case, it would take a couple years for that to make it through the FDA. He didn’t have a couple years as every day he risks permanent and total paralysis if he were to get hit in the head the wrong way or from a car wreck or whatever, his neck is unstable, it had to be fixed. His surgery was November 22; it was 8 hours. It does sound risky, it is risky as is all surgery but this, or something more radical like total fusion, had to be done. It will be a very long healing process. Bradley believes that he’ll be back in the saddle within just a few weeks; we hope and pray that this will be the case. His determination and courage are quite admirable. We have a long road ahead of us, and as you read below (this site is being updated daily) you’ll see that this is not easy. The following is a recap of the day-to-day happenings of his case, written by Bradley’s friend Donna, who went to Germany with him. It’s been revised daily to depict the series of events and was originally designed to simply update friends and family of what’s going on. 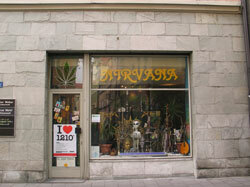 Now, it’s being used to help others who are in a similar shape and considering all their options, including Germany. His team of doctors and nurses are quite remarkable. Have arrived London, awaiting flight to Munich. Hoping to get a good connection with internet. Dr. Fenk-Mayer last night at Pro-Spine in the Bogen office. 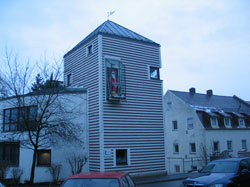 Bogen and Straubing are northeast of Munich, about an hour or so. Dr. Fenk-Mayer works with Dr. Bertagnoli and all is set for our arrival at the hospital on Monday. They will even have a bed for me so that I don’t have to come and go from the hospital but can stay next to Bradley even in the night. They asked him if they could film the operation; he responded, sure if he gets a copy of it. And she told him no golf, no major sports, nothing for a minimum of 3 months. He can play the flute as soon as he wants/feels like he can. More later. It was a cold, snowy day. Walked into town, found the town square and a great Italian meal. Snowing, pretty cold. Ate like horses, took a cab back to the hotel and laid around doing nothing the rest of the day. I actually took a long dreamful nap – that never happens! And Bradley played his computer game and watched the rest of a movie. Probably make an early night as we have to be at the hospital at 8 a.m. tomorrow. There will be breakfast made by the hotel at 7 and Peter Hoch, the best cab driver around, will pick us up and actually take us into admissions at the hospital. They really have it down here. All is well. Admittance day. Interesting — and I have to say, so far, the Germans know how to do hospitals! The American folks should take note… the hospital is not dirty and it doesn’t smell funny. There aren’t people sitting around clogging up the hallways; the hallways are wide, there are large wide circular stairways to walk up and down on so the elevators aren’t clogged. The people are friendly, they have a system that they follow and things get done. They also have hours. They close up for business in the evening. Of course a nurse stays on through the night, but all that needed to be done is finished and the sickest people are cared for before those who don’t need so much help. The red light goes on, the nurse RUNS down that hall to take care of people! I’m totally impressed. 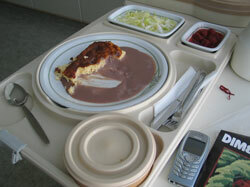 The food on the other hand, well, it IS Germany. And it IS a hospital. But it came on a really pretty china plate and it had presentation and if you’re German, I’ll bet it tastes damned good. The cheese alone here is going to kill me; it’s served at nearly every meal and I love it – I had hopes of losing some pounds since I’m walking between the hospital and the hotel and not really eating every meal or whatever. But wow, when I do get food, the calories and carbs are abundant. Well, we’ll see. Catherine said walking in the cold weather will help melt those pounds away too… let’s hope! Don’t expect much of an update on that account. In any event, Bradley continues to be more brave than I’d ever be. He sent me back to the hotel tonight to sleep – we haven’t had much lately. Can’t get adjusted plus the stress and all. Last night was the worst night of sleep and we were both quite surly by mid-afternoon today. I will stay with him tomorrow – they took my food order, after all! We finally got to meet Dr. Bertagnoli, the genius. He was so warm and nice. 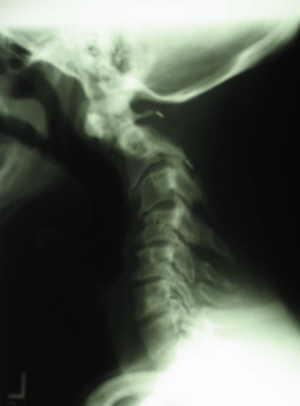 (Dr. Bertagnoli’s website is www.pro-spine.com). Only shining words come from people’s mouths when they speak of him. For now, we appreciate your thoughts and prayers and best wishes. Till the next time – thank you so much. SUCCESS – ? ! While it’s still ICU/recovery room time, Bradley’s procedure under the hands of this most gifted surgeon was a total success. It was 8 hours; Bradley was partially sitting up in the ICU and seems fine. He will be back in his room (3424) tomorrow. I consider 3424 a good number for that MegaMillion lotto – ! Get your ticket! They screwed a plate to C1, 2 & 3 and placed artificial disks at C4, 5 & 6. It’s a true one-of-a-kind surgery and a miracle that we found this place. His neck will now move just a little up and down and side to side. The amazing part is that it was all done from the front of his neck. Mobility has been maintained, something we were not able to find in the States. Certainly today is only the beginning and a lot of things have to be done just right to make sure this works, the fusion alone will take several months to take and that will mean his being very careful until that happens. Check back in a few days for more. Well, while we believe the surgery was a success we’ve hit a little BUMP in the road. When I returned to the the ICU this morning, I did not find him in his room but was told he’s in the “operations room…. problems with his breathing.” I tracked down the #2 surgeon, Dr. Fenk-Mayer who happened to be on our floor in Section 34. She said she just called down there and he was fine, but turned and ran to check it out. It turns out that he has developed a hematoma around the vertebrae and the swelling from the surgery and the hematoma were cutting down his ability to breathe on his own; the hematoma is pressing on his esophagus. 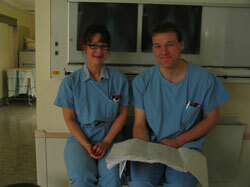 The procedure was then to intubate him again (under sedation) and to get his breathing under control. I’m told the cat scan showed that the hematoma is not large enough to require going back surgically and fixing it; they will use drugs and sedation for 48 hours to hopefully see it subside. Yes, I’m freaking out but they’ve assured me that he’s fine. They moved him to a private ICU room and he seems to be relaxed. Totally asleep. When I asked what should I do for the 2 days that he’ll be asleep, they told me to “take an excursion to Munich or go sight-seeing.” Needlesstosay, I don’t feel comfortable with that idea. I’m back in my room to make reports on this site and to send emails. As soon as I know more, I will post them. Perhaps I can do a little work. Please keep him in your prayers. A long and grueling day for me, I’m certain it was much worse for Bradley. He remains sedated although he did open his eyes on occasion and would some times nod or shake his head regarding pain or being warm or wanting to move around. The nurses are incredible but they’ve all, including the doctors made it clear that it’s best for me to not be there too much. He does try to sit up which he should not do; he moves his legs around a lot and I think he’s just tired of laying there. For the most part he’s in la-la land but I’m told he’s aware of me or whoever is in the room. He’s squinting that forehead at me as though we were sitting on the sofa at home and he thinks my question is dumb. So I guess he’s ok. 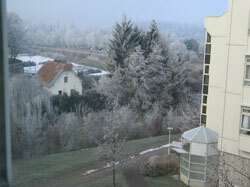 The weather has turned incredibly cold and is supposed to stay this cold for some time, at least through the weekend. I haven’t figured it out in Fehrenheit degrees, but I think it’s about 25 degrees. 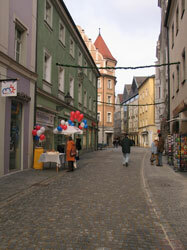 I took a train to Regensburg today and rented a car. 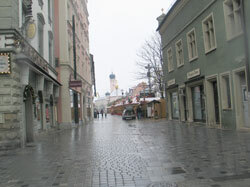 After collecting the keys to the car I left the train station for a walk in the historical part of town. My photos are shown below. Then back to the hospital. After spending a couple hours with Bradley who is still asleep, I had dinner at the Hotel with Dr. Bertagnoli’s American Liaison, Anita Peludat. Anita is from Connecticut and she’s been a wonderful help throughout this process. 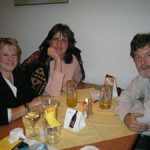 We also shared dinner with Kevin from Michigan who’s wife Sandra had surgery on Monday to repair some major lumbar problems. Thanksgiving dinner consisted of venison & potatoes and salmon and noodles. Yummy – finally some decent food. They’ll be rolling Bradley into the O.R. at 8:00 a.m. There will be an anesthesiologist and a few other important doctors who will be prepared if necessary, to insert a trachectomy should he not be able to breathe after the tube is removed. I’m not supposed to come to the hospital until after the procedure is over. I’ll be there by 8:30 or so. I’ll update you later tonight. Please keep him in your prayers. Breathe Bradley Breathe! Well, we weren’t so lucky today. The hematoma continues to be rather large and they’ve decided after looking at the CT scan to wait another couple days before trying again to take him off the tube. No trachectomy though, they don’t want to do that unless absolutely necessary. He’s ok. I’m with him most of the day and he responds well. The doctors and nurses all say the hematoma is not that unusual for such a large surgery. I’ll let you know next week how things are, unless of course, there’s radical improvement over the weekend. Have a good weekend. And thanks again. Radical is the word all right — when I arrived in Intensive Care (IntensivStation) this morning, Bradley was sitting up in bed and giving the nurses a really hard time — apparently he had inadvertently (!) taken that tube right out this morning and was on his way to getting over that horrible experience. Coughing, hacking and trying desperately to sleep was the mode of our day today and I thank God and all your prayers for helping that hematoma to shrink enough that he can now breathe on his own! It’s late; no food all day and a quick stop at Burger King. I’ll try to update again on Sunday night. Things were going pretty well most of the day, dealing with coughing, pain, but talking and doing some laughing. Then Dr. Bertagnoli came into the room with other members of his team. It was 6 p.m. Can’t say some people don’t have a screw loose… At least that’s Bradley’s case. They just took him in to OR to fix a screw. And to remove the remaining hematoma. Get him back into your prayers, please. It’s 8 p.m. Thanks. Out of surgery, back in ICU. Tomorrow is another day. Let’s hope it’s a really good one. I’ve learned not to say the word “success” until there really is some. We’ve been blessed to see Bradley come out of his 3rd trip to the O.R. to go back into ICU. He will remain intubated until tomorrow morning when hopefully, the tube can be removed and he can start real recovery again. Thank goodness for these loving, kind doctors and nurses that work at this hospital. Back in ICU and awake, not so much coughing and some standing already. A new more substantial collar. A pretty good day although exhausting for both of us. We won’t assume they’ll all be like this; another operation and recuperation will be long. A better collar and no movement for some weeks. Outlook is good, most of the tubes removed. Hoping for his own room tomorrow; will let you know. Quick – my battery’s going down… BRADLEY IS OUT OF INTENSIVE CARE AND BACK into his own room. He’s having a lot of problems swallowing but now has a central line in his arm to feed him which we hope will be for a very short time. His spirits are pretty darned good and he’s gotten some doctors to having a good laugh. He has plans to ice-climb with one of the male nurses in the ICU. Of course, we’ll have to talk about that one! Not to mention the skiing he wants to do with his anesthesiologist. We just now need his esophagus nerves to remember what they’re supposed to do and we’ll be more on the mend. Still planning our return home on Dec. 10th. I sure hope we can keep to that schedule! Thank you again for your thoughts and prayers. First day down the hall from his regular room with his therapist, Josef. Really happy about that. If we could just get that medicine and nausea thing worked out, we’d be flying happy. Lots of things to learn about movement, muscles, etc. but the day has been better than last night. He’s near to his first shower too. Today was a day of highs and lows; waiting for the xray to be taken, having the xray taken, looking at the xray, talking to the doctor – whew, it was exhausting! The doctor’s main message is that it will be so important that proper posture, walking, sitting and everything be done absolutely correctly for the next 6 weeks. But you can see that after his first shower in a really long time, he’s looking FABULOUS! And smiling for a change. The pain is more or less under control and really only hurts at his incision. The old pain is all gone in his shoulder and arms; what a blessing! You can see the bandage underneath his collar where his incision is. All the surgery was done from the front. Really, quite a miracle. Needlesstosay, Bradley is terribly relieved and being careful. Unfortunately, he’s lost about 20 pounds. I’m not finding too much fault with the food here right now but we haven’t quite landed on anything that Bradley really likes, other than the ice cream. And milk products bring him a lot of hacking problems. We’ll find it though! You can see from the xray now posted here, his neck is now straight. The plate that runs from C1-3 is in place with the help of screws and wire, and the 3 artificial disks below are in place between C4 – 6. We actually talked about our trip home today; who gets to carry what. And we can leave the hospital as early as tomorrow, if he wants to. We’ll see how tomorrow is after his central line is removed. We’ve been released from the hospital, under the caveat that we can come back if there are any problems. Had a long talk with Dr. Bertagnoli today; that was quite a good thing. We want to thank the nurses of Station 34 for taking such good care of Bradley and me. Roswitha, Sonia, Steven, Doris and everyone whose names I don’t know. Bradley hopes to play Christmas carols in the main hall on Floor 1 on Tuesday. If you are a person in pain, I will be placing some links to this website very soon that are helpful for both people in pain and caregivers. Being a caregiver is not so easy; it’s important that we share in our experiences and I’m sure there will be more to this website in the future. Thank you again for your love, prayers and spirit. 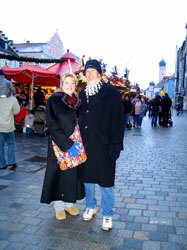 Back at Hotel Roemerhof and a venture out to the Straubing square for the Christmas Market. It’s about 25 degrees today; nice to get out into the air for a while. We’ve met Americans from all over the states this week. Connecticut, Louisiana, Dallas, Montana. 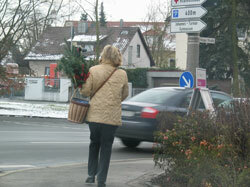 And there are more that are over in the hospital in Bogen. Tomorrow, stitches out and an official exit with paperwork from the hospital. Monday was a really full day of going over to the hospital for stitches being removed, then prescriptions being filled and basically, getting our feet planted for a while. Bradley’s 2nd shower in more than 2 weeks was big in the planning but because we didn’t plan on what would happen with the heat, the medicines and the length of time enjoying that shower, he ended up passed out on the floor of the shower! 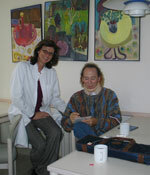 With Gabi from the hotel, she and Donna were able to hoist him up and well, the xray taken in Bogen came out fine. None of the mechanics moved upon the fall and we are VERY grateful. In any event that shower felt really good! Today on Tuesday, Bradley did something not recommended again – it was a 5 kilometer walk (3 miles) and he came back to the hotel feeling really good. 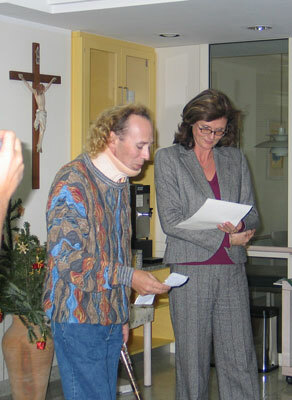 In the afternoon we went over to the hospital and he gave a little concert first for the morning shift (Silent Night, Holy Night in jazz) and again at 3:00 pm, Dr. Bertagnoli, the Hospital Administrator (Maria Stelzl) and other American patients and hospital staff showed up for a little speech and reception with Silent Night solo by the man himself. It was a really special day. Thanks were made to the hospital, staff, doctors, nurses and all involved in helping Bradley to make this next step in his life, free of pain from this nasty spine problem. Concert at St. Elisabeth – ya, bending backward too much Bradley! We must work on that! Mrs. Hein, Dr. B’s right hand. Bradley autographing her CD! Us with Dr. Bertagnoli – all happy that Bradley is well and can play again! Bradley has taken to going on long walks; today we both went and came along this wonderful street with the red house, and then the creek with ducks and only the thoughts of how beautiful this must be in the middle of summer. Then we had the pleasure of a wonderful evening with Dr. and Mrs. Schaaf, Bradley’s anesthesiologist while he was in the Intensive Care. Thank you so much, Dr. Schaaf. Only one more night until that non-stop flight to LA from Munich in the morning. 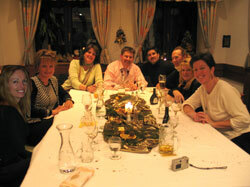 Last night on Thursday, Eckhard from the Roemerhof invited all the Americans to a very special duck dinner. It was fabulous – thank you Eckhard! so much. Today we started to pack, but Bradley’s taking it pretty easy as he’s now completely off pain meds, taking only ibuprofen and muscle relaxers. Those pain meds aren’t kind to him so he wanted to get off of them. We’re going to have a nice quiet dinner alone at the hotel (salmon!) and look forward to waking up easy in the morning to get to Munich for an 11 a.m. flight. See you all soon. Please be in touch again now with Donna’s Road runner address (camperd@san.rr.com) as we’ll be back on line as soon as we get home. Again, we appreciate all your help, prayers and spirit. Lest anyone believe that this is a done-deal, please note that it is not. This website was made for several reason, one of which was to help other pain patients have hope in their quest to relieve the pain, help themselves and their loved ones and caregivers – and to help caregivers in their own quest to help their loved ones. Going into this whole thing I didn’t think twice about doing it other than what it might mean for Bradley and his career, his hopes and dreams and realized that if he didn’t do this, those hopes and dreams might never happen; that if he did do it and there were problems, his hopes and dreams could come to an end but what was his life all about if he didn’t enjoy it. We are both proud to be going through this process but know that it’s been much more difficult than we had originally expected. Please note, while all these pictures look like Bradley is “fixed” these are very early days in his recovery, his healing and hopefully a “fix” to his problems and issues. He is sleeping soundly right now; I’ve been unable to wake him from what seems like the deepest of sleep that he’s needed for weeks. He had hopes of going to his gig tonight at Game Time and either singing or playing the piano since lifting the flute for long periods of time is very difficult at this point. There’s no way to move a person quicker into healing or function. Right now, he needs to heal and this healing process may take a while but every day there is improvement and additional strength. There are, of course, hours or even parts of days that are better than others, but most of that time is aided by pain medication (for which Bradley is taking none other than ibuprofen and a muscle relaxer). Those healing moments inspire great things but all those things need to be taken with care. It’s now time to allow his body to heal and recoup. I’m so grateful that he can sleep; it’s a precious thing to be able to do that in more than one hour increments. Bradley had a Sabrina Massage today which seemed to help a great deal. Things may improve a faster now that he’s finding some peace of mind. Thank you so much for continuing to follow the story; I know it seems long to you; imagine how it is for him. Again, I’d like to remind you of our friend Christie. Please read about her story, it’s much different than Bradley’s and she’s still looking for hope. There is hope for all of the people in pain. There’s too much technology and medine out there for people to not be able to find relief. We hope this helps a little. 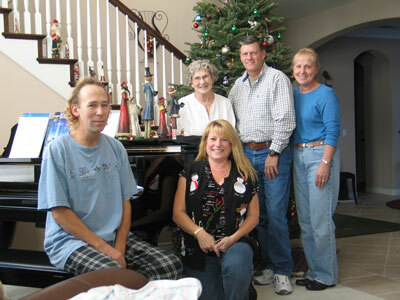 Diane Mintzer, Valerie Seely, Anita Peludat, Eckhard, Mark Mintzer, Bradley, Donna & Margaret. 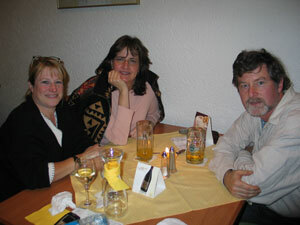 Anita Peludat of Pro-Spine and Eckhard Kommrow of Hotel Roemerhof. December 20 – HAPPY HOLIDAYS EVERYONE! As of today, Bradley continues to improve. He still has that tingling sensation in the fingertips on his right hand and he thinks that his singing voice is gone. He can only reach one octave. We hope that those things will eventually go away and we’d sure like to have that voice back. He remains careful, and we have an appointment with a physician here in San Diego who will follow the case now and help us with things here on US soil. We appreciate all your emails and concern. And, we wish you a wonderful holiday season. Again, if you have any questions and are a pain patient yourself, please feel free to get in touch with us. You can click here to go to our contact page and send as long a note as you like. Thank you. DECEMBER 25 – MERRY CHRISTMAS! HAPPY HANUKKAH! HAPPY KWANZAA! Today Bradley will fly on his own up to Seattle to see his family. His mother is SO looking forward to his visit! and he is too. Yesterday we received in the mail correspondence from Moni Schaaf, the wife of Bradley’s new friend and anesthesiologist, Dr. Wolfgang Schaaf. 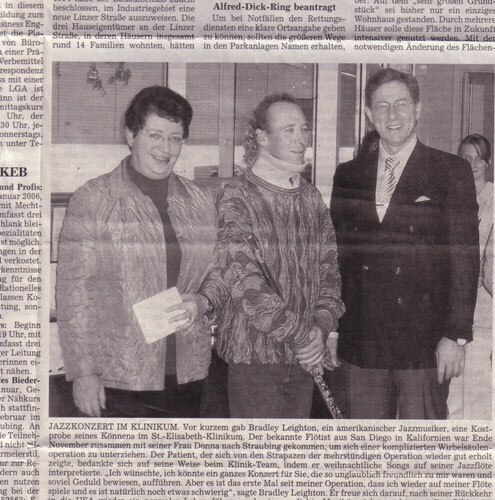 It contained a page from a recent Straubing newspaper showing a picture of Bradley with the Head of Administration at St. Elisabeth and Dr. Bertagnoli. Below you will see the clipping as well as the notes that Bradley wrote for the occasion (written about above as well) and the note that came with the clipping, translating the German. Bradley and Mrs. Hien, taking turns reading Bradley’s speech to the hospital staff. HAPPY HOLIDAYS EVERYONE! 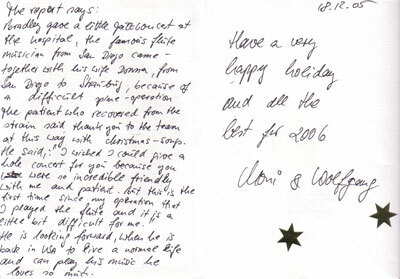 Bradley and Donna wish all our friends, fans and family a wonderful holiday, whatever your celebration — and here’s to a fabulous 2006 for all! Things seem to be going really well for Bradley. We await word from Dr. Bertagnoli about whether or not he can downsize to a smaller collar and his pain seems to be only muscular at the moment; the original pain in his shoulder and arms is gone and there is now a somewhat annoying but never complained about tingling at the end of his fingers. These comes and goes. These things were to be expected and he’s feeling very positive about the future. Donna has designed and made some rather unique collar covers and we planning to paint the soft collar as well. Bradley made his first attempt to gig last week at Game Time – he did really well although it was tiring for him. He’s exercising every day by walking and carrying hand weights and looks forward to physical therapy to regain some of that fabulous arm strength that he used to have. We’re in New York City right now and have a booth at the IAJE conference. (The International Association of Jazz Education). He’s giving interviews today to the Armed Forces Radio and CNN Radio as well as a few others and the album is being played, reports are starting to come in. Jazz Times will have a review in the March issue and LA Jazz Scene has already published a good review. We wish all of you well. It’s been too long since we’ve given you an update; all is well – we still have some ups and downs but Bradley’s patience is paying off. He just today drove for the first time; we went on a Jazz Cruise to the Virgin Islands a couple weeks ago; he’s preparing for his Debut concert for “Back to the Funk” on March 2 and well, other than a really nagging headache and a couple other little things here and there, he’s doing really well. The entire family and our friends and neighbors are all proud of him. His collar is off, he’s not yet in physical therapy but we’re told that’ll probably happy in a few weeks. It’s all about taking it easy, not doin too much at once and being patient. He was really good a couple days ago and worked in the studio all day, took a walk, everything. But he still has that headache. He believes sleep is the key because he feels so much better after a good night’s sleep but has to take something to get to sleep and only when he takes a lot of something will he stay asleep. Otherwise, he’s awake in a few hours. He played the flute today for 45 min., a record since before surgery. His neck hurt the whole time but not after he finished, another new thing, and really good news. He feesl good about concentrating on his new muscles and making them strong. Things are good. 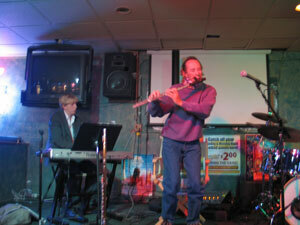 Bradley’s first real concert appearance was last night, Sunday, March 5 in Renton, Washington. 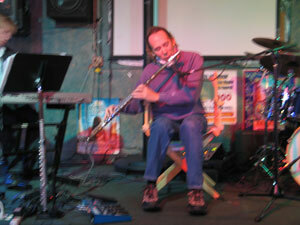 He played with a 7 piece band at Jubilante’ Restaurant to a packed house. It was really fun and he did a really good job. Considering how little he’s played in the past 3 1/2 months, Donna’s really proud of him. All of his family were there and many, many friends. Not to mention a bunch of people who’ve never heard him before who got their tickets at a give-away by KWJZ radio in Seattle. As soon as I can, I’ll get some photos loaded up so you can see how it went. His next concert date is April 2 at Humphrey’s Backstage Lounge in San Diego. We hope you’ll be able to make it! “Time will tell,” and that’s exactly how we read this. We have new xrays showing bone growth in the fusion area of the reconstruction and we have “good looking” ADR happening in the other three levels. We are SO pleased! Bradley continues to be blessed by good health, getting back to his golf game (although it’s a whole new ball game, if you know what I mean) and he’s playing more than he ever has and for the most part, pain free. It’s a miracle. He’s hoping to be on tour in the Southeast portion of the US this Fall and in fact will headline for the City of Gainesville Jazz Festival on November 4th. We’re all flying there for that event and hoping to do some other smaller venues around it. We hope to meet you too. Thanks for checking back, and thanks more than anything, for your love and support! And for fun, click on Mark Mintzer’s site for stuff on Bradley’s appearance in LA at the Catalina Bar & Grille with Sherri Roberts. How fun! We continue to feel incredibly blessed by all of our experiences and the healing process. After an appointment with Dr. Lobatz, back here in the US, neurologically Bradley is doing fabulous. Dr. Lobatz feels that his neurological healing could take up to 2 years, but so far, there are no negative things going on that we should be concerned with. His exercise routine (the gym and a lot of golf) are really helping him to gain definition in his muscles (never had that before!) and his strength is really, really good. 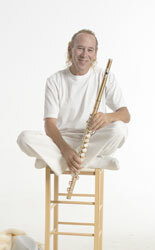 The most amazing part is that he’s playing the flute regularly again and without any pain. 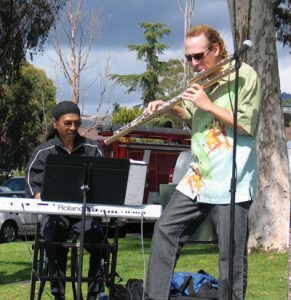 Tonight Bradley will be giving his second concert this week and this time it will be for 300 people attending a fundraiser for the Poway Chamber of Commerce. He’s working in the studio again and getting to record more music to be released this fall. He’s planning the trip to the Southeast for November when he does the Jazz Festival in Gainesville, Florida and the most fun of all is that we found out there’s a Jazz Festival in Straubing, Germany and we’re applying for him to play there next summer. Wouldn’t that be just amazing! Thanks for sticking with the story, we really enjoy telling it. 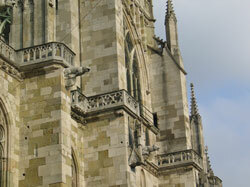 I can now say that after re-reading my notes from those weeks in Straubing I’ve left out a lot of details. They weren’t pretty details so they don’t need to be repeated here, but suffice it to say that time spent during these procedures never fades away. It also makes a person grow in many ways, spiritually, emotionally, and in our case together. We are both so lucky to have each other. September 23, 2006 – it really is a miracle! After meeting with Dr. Westerlund for his 9 month followup, it’s clear that the pain on the right side of his neck is in the facet joint. The doctors will confer on whether or not nerve ablation is required there – a very simple procedure – and sure to relieve any ongoing issues. 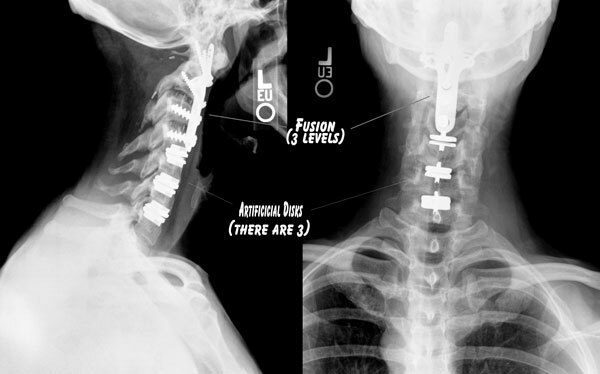 Here are the 9 month x-rays: (I’ve also become much better at photoshop!) This whole thing continues to prove a miracle. An absolute miracle. Bradley’s golfing a LOT, exericising a lot (and exercise seems to be the key to feeling better) and feels really great. He’s looking forward to some really fun gigs this fall and winter, some golfing in Florida after his Festival Gig on November 4th and he really wants to ski. I don’t want him to, of course but he’ll find a way. He promises to be very careful. If you’re a patient and suffering with pain associated with a spinal condition, we wish you the best through your own experiences. You’re welcome to be in touch with us if you have any questions and hope that you too, will be given another chance to be a more normal person again. Bradley continues to do well, he’s golfing and playing his music and working all the time. There does remain one continuing pain that has never quite gone away that’s coming from the 4-5, 5-6 facet joints. He’s had a couple of experimental shots in that area and it seems that they really had the right spot and he’d like to have nerve ablation done at that point. Unfortunately, the doctor that we were sent to doesn’t feel comfortable with that procedure near the disks so he continues to have the pain. He had another epidural done on those joints last week, but all of the pain is not gone, there remains some constant pain in his shoulder. We’ll see how it goes for another few weeks and then get back on a plan. We’ve heard from many people who’ve read this blog and wanted more information. We remain ready to help answer questions about our own experiences and if you have something you’d like to share, please don’t hesitate to be in touch. We were just saying the other day – wow, how long has it been? It’s been a long time – had to look at this blog to remember. It’s wild to think about all of it now but we continue to feel blessed that the surgery happened and he continutes to do well. He’s now a pilot, got his license in 2009 and we’ve taken trips as far in a small plane as one would care to go… we went to Texas late in 2009. He’s learning acrobatics in the plane now, who would’ve thought that could happen? Just so you know, the rest of this page is pretty outdated but new stuff about his musical career is on the other pages of this site. We hope you’re enjoying his new music and we hope to see you at a gig. We continue to get emails on occasion from people wanting more info and to see how he’s doing – that’s all just fine. It’s about time for us to say hi – tell you how we’re doing and bring you an update. The surgery continues to be just great. Bradley had an xray a few months ago and all is well. His only problem now with being post surgery for 12 years is the same thing that we all suffer for as we get older – arthritis. He has some arthritic pain that radiates on the side of his neck and into his head. His neurologist is treating it for now with injections and we hope it gets better. It’s nothing compared to what he’s been through those many years ago. And after reading this again today, it all comes back and I remember how blessed we both are. We have complete confidence in the preimmenent Herr Doctor Professor Bertagnoli and all the people from Pro-Spine. 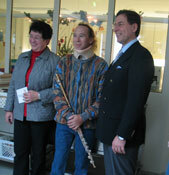 We thank him and his staff, Anita, Dr. Fenk-Mayer, Dr. Schaaf, Dr. Vognar, Dr. 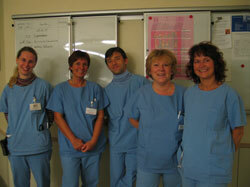 Seaman, Dr. Rupert, Dr. Schoppelrey, all the nurses and doctors in the Intensivstation – Thanks! 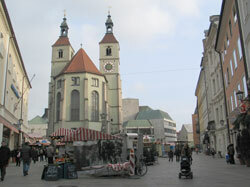 St. Elisabeth Hospital, Straubing, Germany (northeast about an hour from Munich). 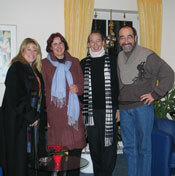 We’ve received great help from Eckhard Kommrow and his staff at Hotel Roemerhof as well. We are in good hands and have decided to stay here for the remainder of our stay. He and his staff have gone so far out of their way to help me while I’ve been traveling between the hotel and the hospital. 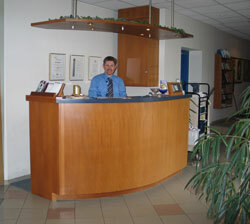 Eckhard speaks perfect English and most of the staff do as well. 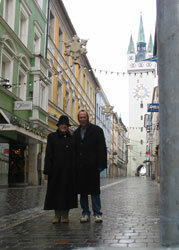 His wife works at the Straubing Library and even brought me some books to read when I ran out. Hopefully, we can still leave for California as planned, on December 10th. Our initial contact wth Dr. Bertagnoli’s office at Pro-Spine was through a patient-advocacy company called Global Patient Network. Mark Mintzer of GPN has been a huge help and we’re very grateful to him as well. Bradley’s R&B Band featuring the music of The Crusaders, Tower of Power, Stevie Wonder & more – Roger (drums), Ron (guitar), Bradley (flutes), Ed (keys) & Sly (bass). We’re told he’ll be back to playing as soon as he wakes up. Golf on the other hand, has gotten better than ever. His new clubs courtesy of his mother and mother-in-law were a big help too but he’s REALLY doing well! Yes, they really do carry baskets here like a purse. And people all over are buying Christmas trees. Christmas trees for sale in the square in Regensberg. 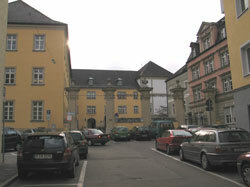 A former castle, now a rest home off of Rt. 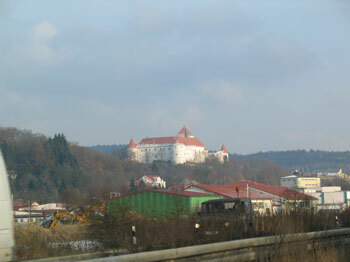 3 between Regensberg & Straubing. 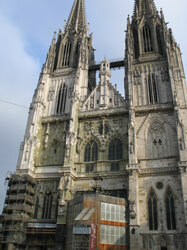 Donna’s Train ride into Regensburg – picked up a car – about 1/2 hour north west of Straubing.